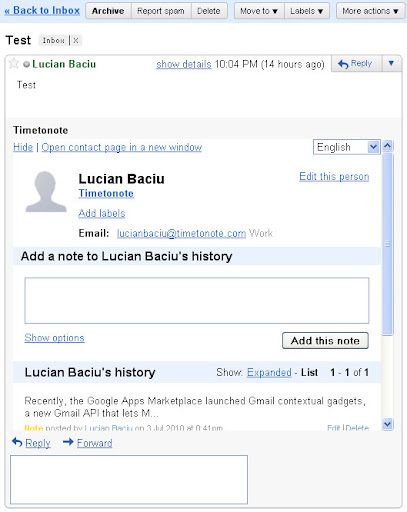 Recently, the Google Apps Marketplace launched Gmail contextual gadgets, a new Gmail API that lets Marketplace apps present relevant information to users right in Gmail, when they’re reading a message. To enable the gadget you'll have to add Timetonote to your domain. If you've already added Timetonote to your domain, you'll have to go to your Google Apps Dashboard and grant Timetonote app access to your Gmail data: sender and recipients. Once the gadget is enabled and is displayed in Gmail, you'll next have to login. This is a one time operation, and once you've logged in, you'll never see the login screen again. Once you've logged in, when you open an email, you'll see the contact page, for the sender of the email, if it's not you (the user) or for the email recipient, if the sender is you, right below the email. If the gadget takes to much of your screen, you can choose to collapse it. In this state, which the gadget remembers when it's opened next time, you'll see only two links: one to show the gadget again, and another one to open the contact page in a new window. Using the gadget you'll be more efficient and you'll get your work done a lot faster. Give it a try. I really think you'll like it. Let me know if you have any ideas or suggestions on how to make this better, I would love to hear them. One more thing, if you like this feature, or if you like Timetonote, please help and write a few words about it on the Google Apps Marketplace. No, the Gmail gadget defaults to closed.